Leyton Orient: A dead club walking at the foot of League Two? Are Leyton Orient, in the words of one supporter, a "dead club walking"? They have a 33-year-old rookie manager - their fourth of the season and 10th since 2014 - who is tasked with prolonging their unbroken 112-year stay in the Football League. Off the field, the O's owner Francesco Becchetti has been in the spotlight for a number of reasons, including a stadium ban in January 2016. It has led to former manager Martin Ling describing the club as "a madhouse". BBC Sport asks what next for the east Londoners? Orient had just lost the League One play-off final on penalties when Italian businessman Becchetti bought the club from Barry Hearn in the summer of 2014. They have not been able to capitalise on his investment; suffering relegation to League Two the following year, missing out on the play-offs last season and sinking to 23rd in the table this term. "All the major decisions which have resulted in us dropping down the leagues at this rate ultimately come down to one man," said Jim Nichols, the editor of the Leyton Orientear fanzine. "Since Becchetti took over it has been a quite steep decline. He never outlined his vision more than big words about how he'd invest money and move up the leagues. "There has never been a plan. Every few months he loses patience, realises something isn't working and tries something completely different." From commissioning a reality TV show where Italian players could win a contract with the O's, to successfully fighting extradition to Albania and receiving a stadium ban and £40,000 fine for aiming a kick at a member of the coaching staff, Becchetti has made the headlines himself. 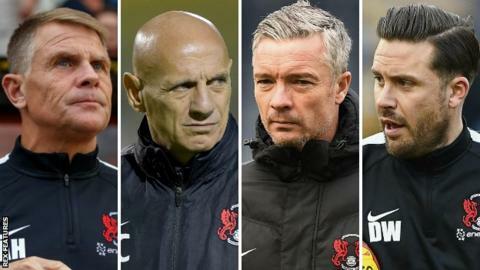 Chief executive Alessandro Angelieri recently questioned the commitment of former players and described the 2013-14 side which secured Orient's highest league finish for 32 years as "a squad without future". However, he has said that the actions of the board have been "in good faith" since the takeover and they remain confident the team will avoid the drop this season. But with the club at such a low ebb, Becchetti is now prepared to consider offers for Orient. Heading for the National League? Last Saturday, Orient slipped into the relegation zone for the first time this season after suffering a fourth-successive league defeat. A day later Andy Edwards resigned as manager to take a role in the England youth set-up. Taking over in November after Alberto Cavasin's seven-week spell in charge, Edwards was forced to rely on youngsters following an exodus of senior players and won just two of his nine games in the dugout. "Because of the mess that has been created above him, Andy was stuck there doing the job with his hands tied behind his back," Ling, who was in charge of Orient from 2003 until 2009, told BBC Radio London. "He's better off out of the madhouse that Leyton Orient has become." Angelieri has partly blamed the club's recent slide on the fact that Becchetti has been unable to visit the players at training or attend matches because of personal business issues. "Mr Becchetti has a great charisma and the players definitely feel his absence," he added. Orient were founded in 1881, and have been members of the Football League since their election in 1905 - but their status is now in jeopardy. "The club are too big to go down, but the way it is going it looks like a distinct possibility," former O's player Matt Lockwood, 40, said. "If Orient let things slip now, it is a long way back coming out of the National League." Former Southend and Hull striker Danny Webb is now the man in the Orient hot-seat. He only joined Orient's first-team coaching staff last summer, after five years working in the club's academy, and stepped up to become Edwards' number two in November. "Management is something I always wanted to get into but it has come a bit earlier than I ever planned," he said. "The fact I have been here since the start of the season in a first-team capacity has helped, because I have been able to learn and develop my philosophy." Former Arsenal trainee Omer Riza and sport scientist Michael Amoah have been promoted from youth team duties to assist Webb and complete an inexperienced backroom staff team. However, Webb also has his 70-year-old father David, the former Southend, Chelsea and Brentford manager, to call on for guidance. "The biggest advice my dad has given me is to stay true to yourself; in how you are as a person and the way you have said you wanted to do things if given a chance," he said. "You can't veer away from that." From the outside it looks like a real tough job. I'd like to think I'll come in and make things work, but life isn't a fairytale. But can Webb inspire a squad who have lost 10 of their 14 league games this season at the Matchroom Stadium? "Danny's age and lack of experience doesn't bother me," said Lockwood, who played over 380 games for the club. "It doesn't matter what level you've played at, as to be a good manager and coach is completely different. "Orient have just got to concentrate on the here and now and fight their way out of the relegation battle." A statement from Angelieri last month said Becchetti remains committed to funding the club "within the bounds of common sense" but the Leyton Orient Fans' Trust (Loft) are calling for the Italian to sell up as soon as possible. They are so concerned about Orient's financial status they are preparing a 'disaster recovery' plan to be shared with their members at their next meeting in March. "What is happening here is the sheer destruction of the club," Loft spokesperson Mat Roper said. "We are a dead club walking. Even beyond this season, if we did survive, are Orient fans hopeful Becchetti will make the right decisions? "If we go down to the National League there is an inevitability about possible administration and liquidation. This club may be no longer come the summer." Loft have written an open letter to show their support for the players and Webb, who takes charge of the O's for the first time against promotion-chasing Carlisle on Saturday. "We are odds-on to go down with the bookies but we are desperate to not be playing at Guiseley next year," Webb said. "We shouldn't be written off yet." Additional interviews by BBC Radio London's Phil Parry, Andy Rowley and Emma Saunders.